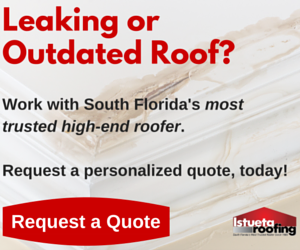 The client called the most trusted roofing contractors in Miami, Istueta Roofing, because his roof was old and needed to be fixed by his insurance company. The client chose Istueta Roofing because of the great reviews he found on the computer. He finishes the interview stating he was impressed with the work done and how he would recommend it to his friends and family. This testimonial video discusses how our newest client was impressed with her new Eagle Flat Concrete Tile Roof installation. Her recommendations to her friends & family is that Istueta Roofing is the most reliable company in Miami, due to its easy accessibility to the staff on the phone plus their friendly attitude. In this testimonial, our newest client describes how the transition from shingle roof to a metal roof was the right decision for his home. He also mentions how Istueta Roofing was very attentive when making the proposal in such as taking photos and not just generalizing the project. The client concludes on how Istueta Roofing is the most professional roofing contractor and how he impressed he was on taking his friend’s recommendation. We apologize for the abrupt ending due to lack of camera memory. Our newest client wanted to do a reroof instead of making repairs and discusses the excellent craftsmanship and personalities of the staff each way of the project. She also mentions how she did a thorough research on choosing the most reliable Miami roofing contractor, Istueta Roofing. Thank you for giving us the opportunity to serve you! This Pinecrest homeowner called the most reliable roofing company due to roofing problems concerning the skydome and wanting a new metal roof. The client was very impressed and satisified with the professionalism and excellent customer service he received from Istueta Roofing. Thank you for giving us the opportunity to serve you! Our newest clients share a few words about their experience with Istueta Roofing, the most reliable roofing contractor in Miami. Our clients really appreciated the thoroughness in explanation of the project and were impressed with the quality of materials being used. They also enjoyed the cleanliness and punctuality of the workers at their home. Thank you for choosing the most trusted roofing company in Miami, FL! Our longtime client first gave Istueta Roofing the opportunity to serve him after Hurricane Andrew and he discusses how the great service at Istueta Roofing continues throughout the years. He contacted Istueta Roofing this time around for leakage in his roof caused by old age and wear and tear. Our client chose a new GAF Timberline Shingle roof with a Birchwood color. He talks about how quality is the most important thing when choosing a roofing contractor and he describes how Istueta Roofing is the most customer friendly Miami roofing contractor, and how he would gladly refer Istueta Roofing to his friends and family. Thank you for giving us the opportunity to serve you again!